Roger Ebert was such a presence in our house, especially on Friday mornings (when movie reviews are published), that we didn’t use his last name. “What did Roger think of the new Herzog film?” we’d say. Steve James’ documentary Life Itself is a thorough, 2-hour portrait of Roger, his impact on American cinema, and on his public battle with cancer. It’s long for a documentary, but I was happy to see it all. James tells the story chronologically, starting with Roger as a young newspaperman, his rise to fame thanks to a Pulitzer Prize and successful TV show, and his early adoption of Internet and social media that coincided with the onset of his cancer. There are side trips along the way, on his professional relationship with Gene Siskel and their TV programs, on his personal relationship with his wife Chaz, and on with the many filmmakers on whom he had a great impact. Boulder even gets a minute or two, thanks to Roger’s passion for the Conference on World Affairs. Colorado film critic Howie Movshovitz gets a minute of screen time as he explains Cinema Interruptus, and recounts a question and answer that illustrate Roger’s wit and ego. Never mere reportage, Life Itself illustrates and animates Ebert’s life. James includes interviews with Roger’s former drinking buddies, with the wife of Gene Siskel, and with Chaz. He interviews filmmakers whose careers were touched by Ebert, including Martin Scorsese, Ramin Bahrani, and Werner Herzog. 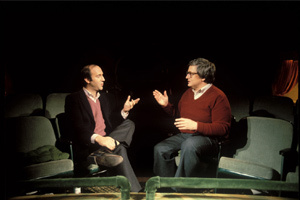 He includes readings from Ebert’s memoir (also called Life Itself). And most importantly, he includes footage of an ailing Roger that he shot himself after Roger lost his jaw and his voice. It’s probably naïve to admit that James’ footage of Roger came as a shock and a revelation. I knew Ebert had lost his jaw and his voice, and I had seen pictures of his face — the photo from the Boulder Daily Camera and the cover of Esquire. But James’ footage of Roger’s lip hanging from his face, or the uncomfortable medical suction used to clear his throat, reveals vividly just how violent his battle with cancer had been. If you used to read Roger’s blog, like we did in our house, you probably heard Roger’s mellifluous voice in your head as you read each post — anyway, I did. Mentally, Roger was all there until the very end, and that’s how I remembered him. But James’ documentary shows the truth: that voice in my head didn’t actually exist any more, and the body housing that sharp mind was falling apart. Many of us wouldn’t want the world to see us in such a state, but Roger was apparently very open about it. James explains through various interviews that when Gene Siskel got sick, he kept it a secret from everyone, including his children, and including Ebert, which hurt Roger. Roger apparently determined to do the opposite, showing the world what cancer can do to a person, and showing that it doesn’t necessarily have to stop you from working. Maybe that openness gives some people the strength to know that a bad diagnosis need not be the end. On the other hand, it might give others of us pause, and a little terror to glimpse what we might have to put up with before being allowed to depart. James delves a little into Ebert’s contribution to film criticism, including a glimpse at the debate between Ebert and Richard Corliss about whether a few minutes of television here and there is good for serious cinema, or whether it dumbs down the conversation about movies. The answer is obvious to me. I wouldn’t have seen Heaven’s Gate or The Gods Must Be Crazy, much less heard about them, if not for Ebert’s advocacy of good independent films. And his list of “The Greats” still serves as a must-rent list for most of the people in my circles. People my age probably can’t imagine a culture of movies not shaped and informed by Roger Ebert. But that’s just my generation. Kids growing up today may look back on Life Itself with puzzlement. This one guy (okay, maybe two, including Siskel) formed the basis for an entire country’s opinion about movies? With the decline of the American newspaper and the rise of the Internet; without Roger’s weekly, dominating presence; we have thousands of tiny voices (including this one), each with a miniscule slice of influence that can’t possibly hope to have the influence that Roger Ebert had. Collectively, we make up the Tomatometer and maybe the IMDB rating, but those measures favor popularity over quality — a movie that nobody hates gets a perfect score, whereas a perfect film that’s not easily approachable merely breaks even. But... that’s life. All you can do is live within the one you’ve got. And if Roger’s serves as any sort of example, the lessons are: Take it seriously; work hard; be honest in your assessments; and don’t be afraid to make friends with your colleagues.